McClain’s Austin Booth watches the ball as it flies toward him on Wednesday at Mitchell’s Park in Greenfield as a Washington High School player bears down on him while attempting to steal second base in the first inning of an FAC baseball matchup. 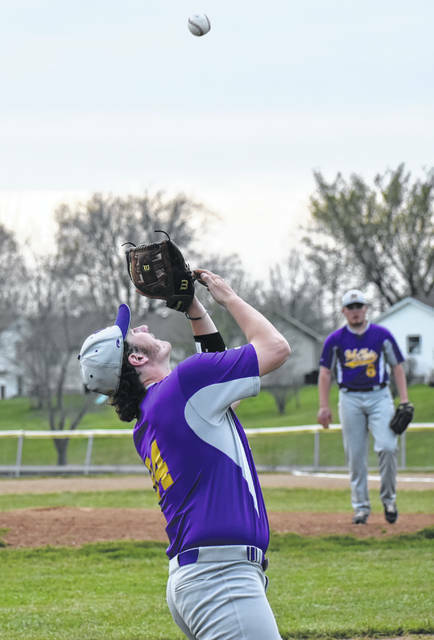 McClain third baseman John Salyers tracks down a fly ball in foul territory on Wednesday at Mitchell’s Park where the Tigers took on the Washington Blue Lions in an FAC rivalry game. 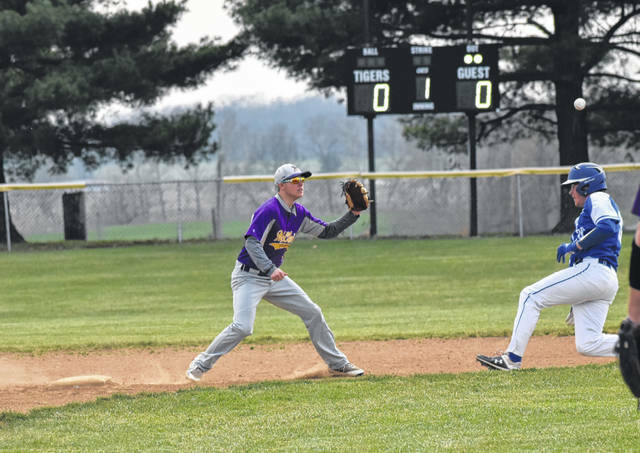 GREENFIELD — The McClain Tigers varsity baseball team hosted the Washington Blue Lions in a 10-0 shutout victory on Wednesday at Mitchell’s Park in Greenfield and are now 4-0 in the Frontier Athletic Conference this season and 7-2 overall. Sam Faulconer threw 89 pitches in five innings of work against Washington and allowed one hit, walked five and struck out four while throwing 52 percent of his pitches for strikes to pick up the five inning win for the Tigers. The Tigers took advantage of a Washington defense that appeared unable to make a play on Wednesday and scored nearly at will as they tallied at least three runs in the first and second innings. The Tigers struck early with lead off batter Eric Anderson smacking a double to centerfield in the top of the first inning and Colton Mossbarger singling from the two spot in the line up to put runners on first and third with no outs in the first inning for McClain. John Salyers follwed up by reaching first on a pop fly that the Washington second baseman was unable to come up with and Anderson scored on the play. Cody Pollock then stepped to the plate and hit into a fielder’s chioce that saw Salyers cut down at second base but drove in Mossbarger for a 2-0 McClain lead. Austin Booth singled to third base two batters later to drive in Pollock who advanced to second base when Mossbarger scored earlier in the inning. Nate Terrell kept the bats hot with a line drive single to short that drove in Booth and extended the McClain lead to 4-0 with two outs in the first inning. Terrel went on to score on a passed ball during the at bat of Evan Hutchinson to make it 5-0 after the first inning. Cody Pollock doubled on a line drive to center field in the bottom of the second inning to drive in Anderson and Mossbarger and push the Tigers’ lead to 7-0. Garrison Banks follwed up with a double of his own to left field that plated Pollock and provided the final run of the inning to make ait 8-0 after two. A dropped third strike against Salyers in the bottom of the third allowed Anderson to score from third base and led to Mossbarger scoring on a passed ball in the next at bat to make it 10-0 in favor of McClain after three innings. The Tigers were able to hold firm on defense over the final two innings of play to preserve the 10 run difference and end the game in five innings via the 10-run rule. “Court House is a real good team, you know, they are well coached. We just came out and were ready to play,” said Tigers Head Coach Rich Bunner. The Tigers will be back in action on Friday when they travel to Hillsboro to take on the Indians in a cross-county and FAC rivalry matchup at Shaffer Park.